Took a look at the Surfside surf camera at lunch. Looked green and calm enough. Waded in about 13:30. First cast a 13” whiting. Kept that one. Got back in with the stringer. Water was clear and green, see your feet and then some in waist deep water clear. Immediately had something with sharp teeth break me off, I’m guessing bluefish. 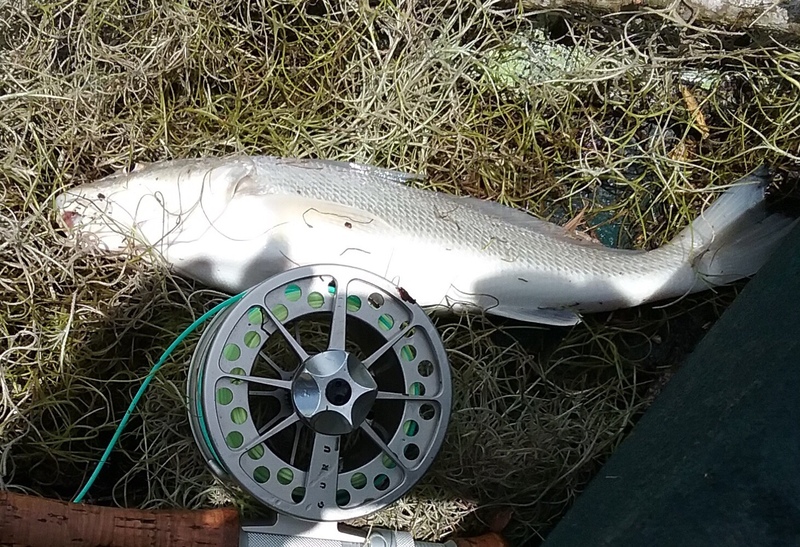 Went and got another rod with thicker tippet and a different fly, a silver and chartreuse redfish crack. Nothing went for that pattern so I put back on another tan borski slider. Started catching fish right away. Those fish were 13-14” trout with a ladyfish or two in the mix. After a while, the trout disappeared and it was all ladyfish with a couple of tiny jack Crevalle. Everything was just into the second gut, just outside the small break. Then some strange dark brownish looking murky water started to move in and suffocate the clear stuff. Decided to move a little into some still clear water. Spooked a large redfish, something around 34-35” while I was wading in about 15” of water. That was a surprise. Got one tiny flounder and the clear water was all but gone. Came on out at about 15:15. The last two surf trips were much the same. Some little trout and ladyfish and a couple of tiny jacks. It was still fun battling those feisty trout even though I didn’t get any keeper fish. Ladyfish aren’t my favorite as the tear up flies and leaders, but they do jump a bunch. The flies. The borski slider in various colors has been good all summer, surf or marsh. Sounds like fun. Do you find that muddy water kills the bite for flys? I'd have maybe been tempted to tough it out with something with a lot of vibration like a rat-l-trap or spoon; but not sure how that would work with a fly? Great report! Have you tried a muddler minnow? The one fly looks similar to a muddler. Well done! Chubs wrote: Sounds like fun. Do you find that muddy water kills the bite for flys? I'd have maybe been tempted to tough it out with something with a lot of vibration like a rat-l-trap or spoon; but not sure how that would work with a fly? Reason might say that muddy water with poor visibility would prevent fish from locating the fly, but that’s really not how it is much of the time. I have used tiny Pyrex rattles in a Shrimp pattern and noise making beads on the Avalon Permit Fly and maybe it helps (the jury is still out). I’ve still caught fish on the same Shrimp pattern when the Pyrex rattle inevitably breaks. I’m not really sure how fish locate smallish flies in limited visibility water. But I really focus on bait disturbances if I can’t see the target fish themselves. Basically, I believe by the way the bait is acting the predators are close by. Then I just put the fly into the zone and it often works out. Fishing by faith. I’ve had trouble at times in clear water with visible predator fish, trout, redfish, even a couple of snook pursing a fly and then turning away at the last second. Not sure what went wrong, but something turned the fish off. But I’ve had fish follow paddle tails in clear water and veer off at the last moment. One time a few years ago, I had that happen with a paddle tail and immediately tried a fly, orange redfish crack, and the fish went for it. I stayed with that fly and had some more hook ups on it. This summer I was fishing from a boat in pretty clear water and had several trout veer off a normally productive pink borski slider. I tied on another and still got rejected. I went to a silver redfish crack type fly and that got me a few fish. Fish can be moody is all I got for an explanation. kickingback wrote: Great report! Have you tried a muddler minnow? The one fly looks similar to a muddler. Well done! Not out in the salt, but the muddler has worked in freshwater. 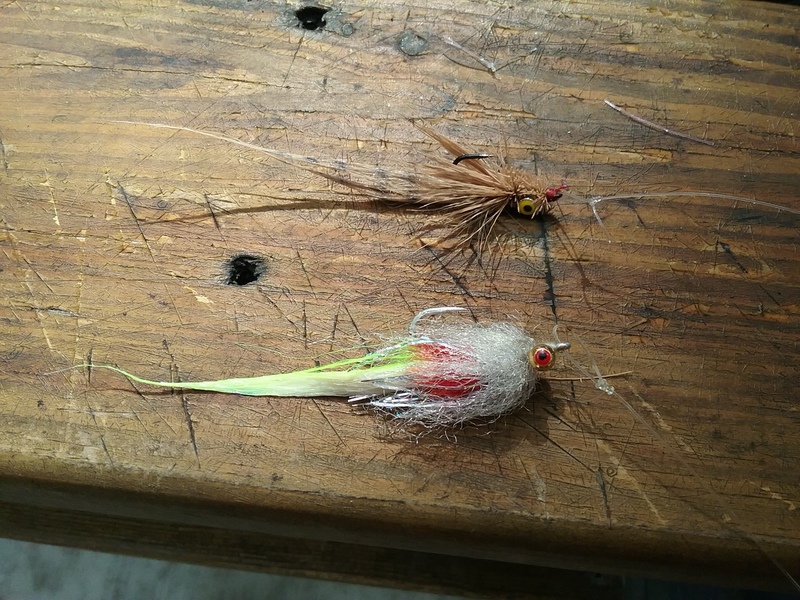 I have tried a deer hair diver a time or two in the salt, but just have a couple of misses. The Borski slider is a lot like a muddler minnow, except I weight most of my Borski Sliders with small tungsten dumbbells to get them down fast. I once tried a couple of size 6 bead head woolly buggers at some sighted redfish, but they really weren’t nearly as good as a redfish crack at getting a take. But the saltwater patterns I’ve tried haven’t worked well at all on the freshwater lake I fish, except clousers, they work both in the saltwater and fresh. karstopo wrote: Took a look at the Surfside surf camera at lunch. Looked green and calm enough. Waded in about 13:30. First cast a 13” whiting. Nice report! What parts of the surf do you recommend? Or just any beach access. Thanks! I usually start out looking at the Surfside beach camera and/or the buoy data offshore. Like it to be 1.6 feet or less on the wave heights, although 2 feet can work. I usually hit the pay beach first at Surfside or go out to Bryan beach and drive along looking for bait sign or some better guts or maybe water pouring out of the first gut over the second bar. None of the guts and bars are uniform moving along the beach and they shift around with the tides , currents and wave angles. Sometimes, the first gut, especially early, is the place to fish. The gut will often terminate in a cone shape into the shoreline. I’ll wade those spots and it’s nice if they are thigh to waist deep. Fish might be right along the edge of the bar or out into the gut. Sometimes, the fish are into the second gut. I really try hard to see any bait doing anything that suggests predators are close. If I see bait getting pushed or attacked, I’ll cast into that zone or move close enough to cast into the zone. Many times I’ll be wading a bar and see some mullet or menhaden getting messed with 75 yards down the bar. I’ll wade to them unless I’m sure they are moving quickly towards me. If I’m pretty focused, I’ll fish a spot for a bit then move up or down the beach until something else, the bar/gut structure or the bait activity catches my eye. I’m looking for nervous bait, shrimp hopping, birds, things like that. Really, any spot up and down the beach can work. I wouldn’t stay too long in a place with little bait activity or action unless maybe there’s a big crowd out there. It can be tough on busy weekends to find room. Now that September is here, the crowds are gone. Richtroxler also has some good surf reading videos on Youtube. Chubs wrote: Great tips Karst!